$99 is a bit pricey, but who buys a single-day ticket to Disney World anyway? ^Exactly. For the majority of visitors this isn't really a big deal. It more so just punishes random people that come down to go to only ONE Disney park and choose the flagship. Ever since they did the switch to the 'Magic Your Way' Tickets it's been about keeping people on property and rewarding those who stay longer. That's still a great deal. A one-day lift ticket at a semi-popular local ski resort is $116, and it's only open from about 8:30-4! Just minutes ago, Walt Disney Imagineering released a new video of Seven Dwarfs Mine Train during our live chat with Imagineer Dave Minichiello – and we wanted to be sure you didn’t miss it. In the video, we compare footage of a full onboard of the attraction side-by-side with an original CGI onboard that was created early on in the attraction’s development. Jenn Fickley-Baker: Good afternoon and welcome to our latest New Fantasyland live chat. Today we’ll take a look behind the construction of Seven Dwarfs Mine Train with Walt Disney Imagineer Dave Minichiello. Jenn Fickley-Baker: We look forward to all your questions, but please realize we won't have time to answer all of them in today's chat. As you submit questions, they’ll be put into a queue and will not appear at first in the live-chat window. Please also remember to keep your questions family-friendly. Jenn Fickley-Baker: Welcome to our live chat, Dave. 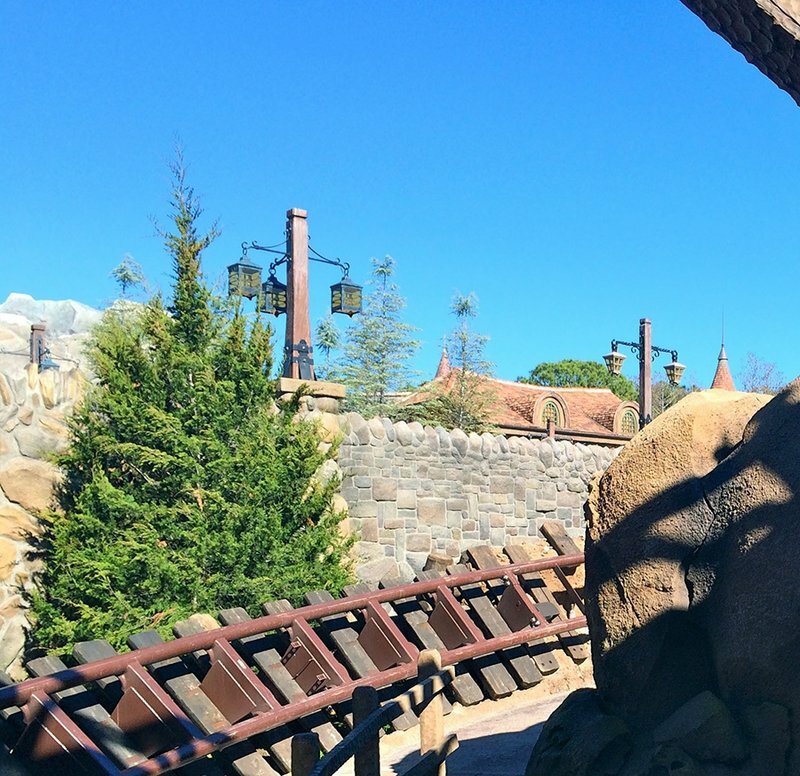 Thanks for joining us again to talk Seven Dwarfs Mine Train. Dave Minichiello: Hello. 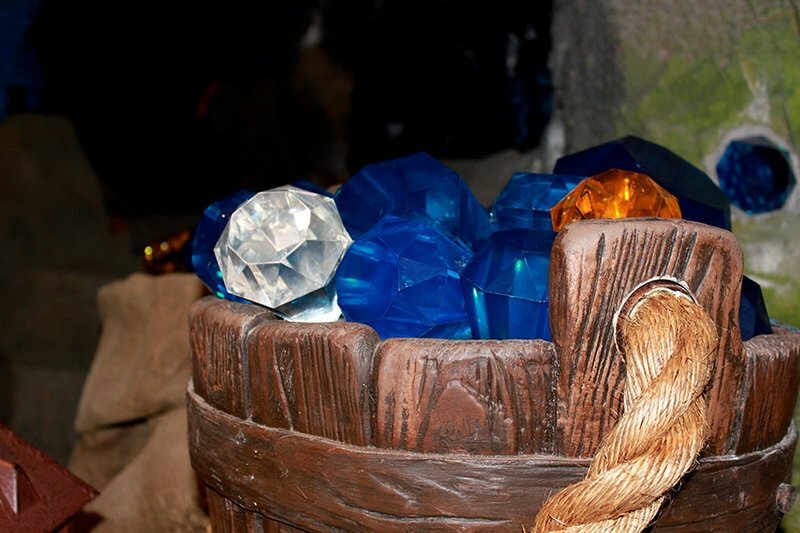 We’re really excited about Seven Dwarfs Mine Train - it’s that final gem in the overall New Fantasyland project and we’re excited to share it with our guests. Thank you for following us along on this final piece. Jenn Fickley-Baker: First of all, can you give us an idea of how you’re involved with the construction of Mine Train? How long have you been on the project? Dave Minichiello: I’ve been on this project for over two years. I started as an art director on the Mermaid attraction and will be taking Mine Train all the way through opening as creative director. 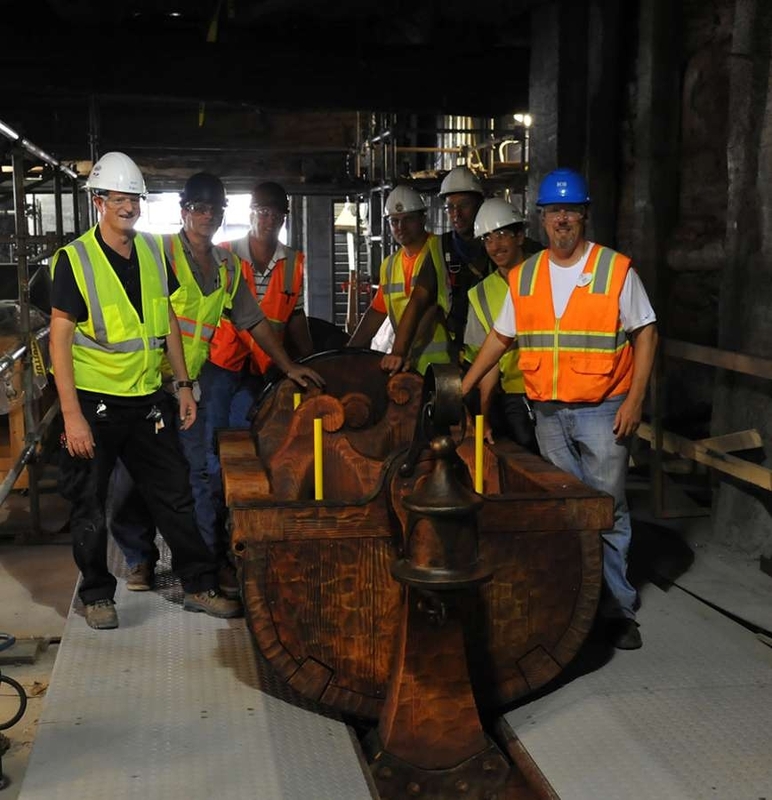 Jenn Fickley-Baker: How is Mine Train coming along? Any recent milestones? Dave Minichiello: It has come along amazingly well. Pretty much every day is a milestone and some major ones that I’d like to mention are the Dwarfs Cottage, which is going quickly and looking amazing. The Seven Dwarfs Mine Train being a part of the forest - we’re starting to see it as a part of the forest with the tree planting. We’re finally starting to see it all come together. Jenn Fickley-Baker: Just judging from the last time I walked by the attraction in New Fantasyland, a lot of progress seems to have been made recently on the exterior. What’s the latest on that? Dave Minichiello: Again, the top of the mountain is being planted with trees, the final rockwork is being completed as well as thematic painting of the rockwork. Ride testing continues daily. Now what’s really nice is the propping the attraction both inside and outside. Jenn Fickley-Baker: Let’s back up to the start of the project for a minute. 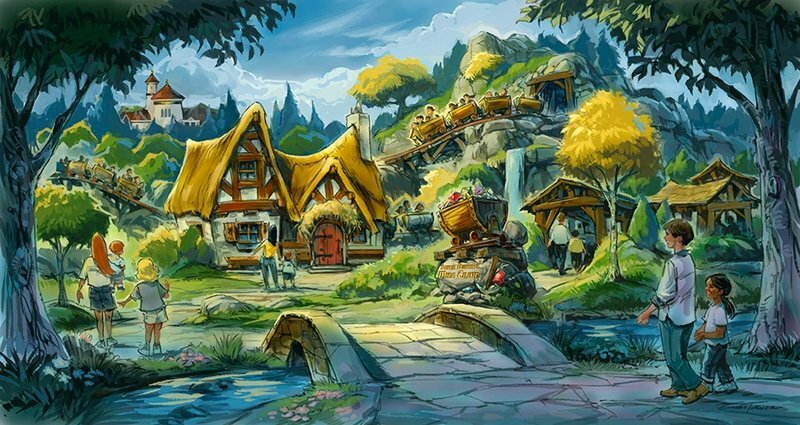 We have a question from Disney Parks Blog reader Viveen, who asks, ‘Why was the Seven Dwarfs Mine Train ride idea chosen? Dave Minichiello: I think when we were looking at New Fantasyland and trying to create a mix of attractions that would offer a broad variety of experiences for our guests, we were looking for a family coaster type of experience. That led us to Snow White and a Mine Train type of vehicle. As a centerpiece of the New Fantasyland expansion, we also thought that this type of experience would create kinetic energy throughout the land. Jenn Fickley-Baker: So once you decide to base an attraction on a specific film, how do you decide what kind of attraction you want to build? Dave Minichiello: Generally, our ride systems are based on the kind of experience we want to create. We thought the Mine Train would be the best. We try to develop our stories first, and then create a ride vehicle that helps us tell the story. Jenn Fickley-Baker: We’ve heard Imagineers say before that Mine Train focuses on the story of ‘Snow White & The Seven Dwarfs’ from the Dwarfs perspective. What is it about the Dwarfs that give them a unique perspective on the story of ‘Snow White’? Dave Minichiello: The Dwarfs are really fun and lovable characters and I think that after seeing the classic film of Snow White, how many of our guests wouldn’t want to go into the film? This attraction gave us an opportunity to go in depth with other story lines in the movie. Dave Minichiello: You’ll be able to experience many of your favorite characters from the film. Jenn Fickley-Baker: Let’s talk about the type of attraction for a second. Elizabeth from FL asks, ‘I am really excited about this ride! I am just wondering how it will compare - speed and dropwise - to other coasters such as Space Mountain and Big Thunder Mountain’? Dave Minichiello: It’s a family coaster and it’s a unique experience unlike anything else in our parks. This attraction is more innovative in its ride system and vehicle. It is for the entire family. It gives the guests a new sensation they’ve never had before. And we felt that uniqueness was the best way to tell our story. Jenn Fickley-Baker: It has been described as a combination of a family coaster and a dark ride. How does that work? 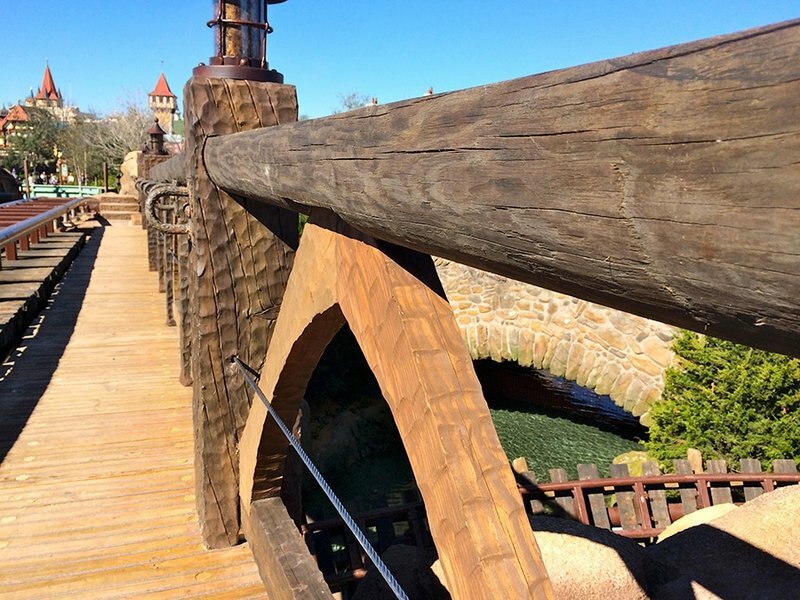 Dave Minichiello: What’s special about Seven Dwarfs Mine Train is the journey. You travel through the forest and explore the mine where the dwarfs are working, but we’re seeing the mine in a grander scale in a way we’ve never told the story before. Jenn Fickley-Baker: We have a pretty good video to share today, too. Can you set up what we’re about to see? Also, just a note to readers who are following along live - our video will auto-play, so you may wish to adjust your audio now. Dave Minichiello: What’s interesting about the video is that there’s a CGI model, which was the first concept model that we developed for this show. What’s amazing is seeing how accurate it was to our initial concept and vision. What’s amazing is how accurate the sight lines are, the staging, the scaling, the variable speeds. We’re fortunate to use innovative technologies during the development of our attraction. Jenn Fickley-Baker: I love it! It looks like the Mine Train will offer an amazing view at night - especially of some of the bigger Magic Kingdom landmarks. What all can you see from up there? Dave Minichiello: Yes, this is an attraction that has as many amazing views on board as off. From the very beginning, we wanted to showcase those sightlines and see Storybook Circus, a little bit of Mermaid, then we head inside the mine to see the Dwarfs, you come out and see Prince Eric’s Castle, and an amazing view of Cinderella Castle. At our highest lift, you see Prince Eric’s Castle, Beast Castle and Cinderella Castle, so the views are spectacular. Jenn Fickley-Baker: Seeing this video reminds me of one of the bigger elements we’ve discussed in the past about Mine Train - the ride vehicles. They are something WDI designed to be unique to this attraction, correct? Dave Minichiello: Based on the type of vehicle we wanted to use to tell the story, we started looking at a mine vehicle and thought that it would be a fun guest experience to sit in a mine car. Jenn Fickley-Baker: Now that some of the trains have been on the track for testing, how has that new design worked out? What does this type of ride vehicle add to the storytelling of the attraction? Dave Minichiello: It has proven to be pretty amazing and a very smooth attraction. It’s a completely new experience - not only having the sensation of pivoting back and forth and it varies throughout the attraction. You feel differences in the various terrain around the mountain. Jenn Fickley-Baker: And of course, we have to mention the detail that went into designing these cars, which were individually handpainted and aged. We shared a behind-the-scenes video on the making of the Mine Cars a few weeks ago. Here’s a look at the work that goes into something like that. Dave Minichiello: Things are going very well and we’re excited to see all of the layers coming together. Each week brings a new and exciting level. Jenn Fickley-Baker: The train seems to slow when it hits that “dark ride” point - anything specific we should look for in there? Dave Minichiello: The reason the train slows is to allow the guests to enjoy the details of the scene. We wanted to let our guests discover their favorite dwarf. All seven are hard at work in the mine scene - and we do have some hidden stuff in there. What will the music in and surrounding the ride be like? Dave Minichiello: The queue has a surprise song in it that was originally written for the film called ‘Music In Your Soup,’ which we’ve recorded in instrumental version and added to our queue area. All of the music in the queue area is all instrumental, and we wanted to give it a feel that it was played by the Seven Dwarfs. Will there be an interactive queue? if so are there any details you can share? Jenn Fickley-Baker: And from Caitlin, ‘What are some special Hidden Mickeys or little details that we should look for?’"
Dave Minichiello: Well, each mine train is very unique and we wanted to make them look like they were used in different times. When you see the vehicles themselves, there’s a lot of layering to them. While you go to the mine and there’s a lot of rustic wood and wood graining throughout the attraction, some of the wood carving is something you seen in the film and we’ve picked that up. The scale and the character of everything around you starts to go into the dwarfs’ world. Jenn Fickley-Baker: We have time for just a few more questions - and are getting some specifically about accessing the ride. For example, what is the height requirement, and Disney Parks Blog reader Teresa asks if it will be available as a part of FastPass+? Dave Minichiello: Yes, it will be a part of that offering. Dave Minichiello: It’s 38 inches. Jenn Fickley-Baker: We’ve received a lot of questions about opening date. Dave Minichiello: We’re on schedule for spring. Jenn Fickley-Baker: Obviously when Mine Train opens it will not only be the debut of a new attraction, but it will mark the completion of the entire New Fantasyland expansion. In your opinion, how successful has this project been? Better than expected? Dave Minichiello: For myself and all of our team members, it has been really special to bring all of these stories into Magic Kingdom for our guests to experience. Jenn Fickley-Baker: Have you given a thought yet to how you’ll celebrate that opening moment? Dave Minichiello: After having worked on this for a number of years, it’s always quite an exciting moment to see the first guests and families experience the attraction. We’re really looking forward to it. I’ll probably spend the day out there watching guests enjoy it. For us, it’s fun to see the end goal and how the guests will experience it. It’s kind of why we do what we do - for me anyway. Jenn Fickley-Baker: Thanks so much, Dave. Jenn Fickley-Baker: Thanks everybody for joining us for our live-chat with Dave. As a reminder you can revisit this chat at any time and click 'Replay' to review all the questions and answers. Last edited by jedimaster1227 on Mon Feb 24, 2014 1:31 pm. ^ Mmmm, it's looking better and better. Thanks for sharing the video and all this information from the chat! I think this ride will be a big hit with guests, and a big improvement over the old Snow White's Scary Adventures ride. The swinging action of the mine cars is pretty cool. I'm still curious where The Wicked Witch shows up, here. I suspect it's at the top of the first lift hill. Where those buzzards are perching? But who knows? It'll be great if she shows up at least twice. 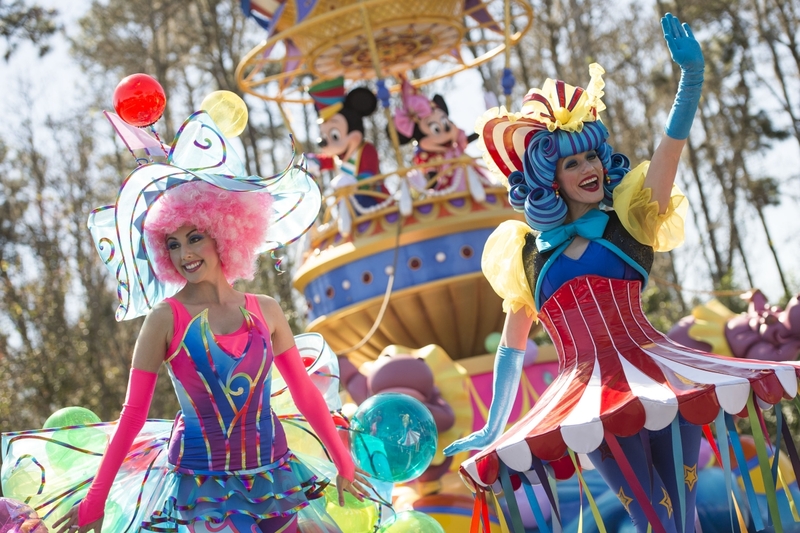 Today, we’re excited to share with you that the incredible, new daytime spectacular, “Disney Festival of Fantasy Parade,” will make its grand debut at Magic Kingdom Park on Sunday, March 9. All the enormous, colorful floats have been constructed. Costumes have been designed and created. The original musical score has been recorded, and now the Cast of the “Disney Festival of Fantasy Parade” is busy rehearsing for the premiere performance! Before rehearsals could begin, Show Director Randy Wojcik and Choreographer Stephen Di Schiavi held a choreography workshop to further develop their initial ideas about staging and movement. They recently gave us a peek into that workshop, for a taste of what we can expect to see when the performers bring the stories of “Disney Festival of Fantasy Parade” to life on the parade route. So who else is ready to join the celebration, once the “Disney Festival of Fantasy Parade” debuts March 9? ^ That one on the right. or a really Really Interesting drag outfit. Mickey and Minnie's FAAABULOUS ! Priscilla Parade.